Use the warmth of your hands to form Bee's Wrap over the top of a bowl, half a lemon, or a piece of cheese. The wrap will hold its shape when it cools, creating a seal. And when youre done wash with cool water and gentle soap and reuse. Bees Wrap is a natural sustainable food storage solution as an alternative to plastic wrap. Bee's Wrap lasts for up to a year with proper care and regular usage. 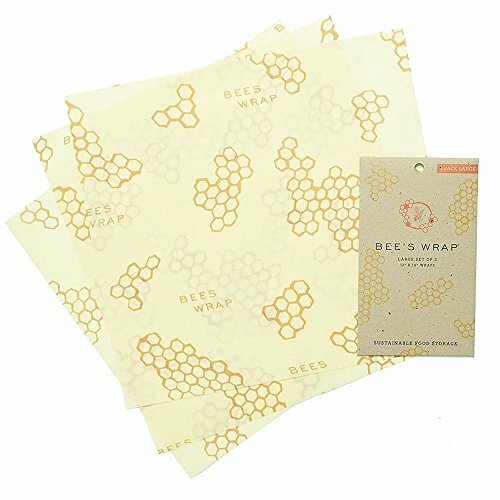 Item Specifics Size: Large 13 x 14inch Pack Size: 3 Material: Organic Cotton Pattern: Honeycomb Print Good to Know: Bees Wrap is washable reusable and compostable. Made with organic cotton beeswax organic jojoba oil and tree resin. Bee's Wrap lasts for up to a year with proper care and regular usage.